Now is the time to invest in striking HD display technology to capture the attention of your audience. 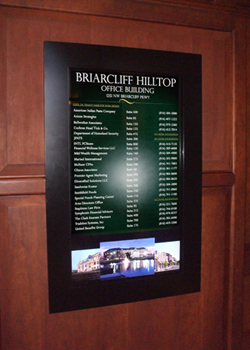 Digital signage directories are ideally suited for hospitals, campuses, office buildings and other public spaces where visitor information and wayfinding needs are paramount. With its ability to reach multiple locations with real-time information, digital signage can act as a powerful platform for intra-company communication, and a well-placed digital sign can also be an ideal way to generate advertising revenue. Digital signage allows for easy updating of information and can incorporate multiple attractive features such as current weather or newsfeeds. Whatever your needs, let our expertise help you to craft the perfect solution.